In recent years there has been great developments with cross platform libraries, many of which are a great fit for the C language. Lets start off by running though a few libraries, first off the obvious one – OpenGL, there has been some upheavals with OpenGL over the years, but all in all, once you really get to grips with it, there are a wide variety of options if only because of its lower level nature. Because OpenGL now leaves a number of things to the programmer its helpful to have some other libraries to support it. For the maths I favour kazmath which is simple and allows you to take just the parts you need (for convenience I like to compile it into a static library). Another very useful library for use with OpenGL is GLFW this helps with window creation and input, it works well across platforms and is reasonably straight forward to use. Along the way I’ve picked up LodePNG which is just enough code to load an image, added to some code I wrote a good five years ago when I put together gles2framework it leads to an easy way to get a texture from a PNG image file. Finally there is glLoadGen which provides some code to load function pointers allowing you to access all the functionality you need, once the code and header has been generated its as simple as calling a function after a GL context has been created. I’ve kept the majority of code in the main.c file, there are a few functions in utils.c but they aren’t pertinent to learning OpenGL and are fairly self evident. 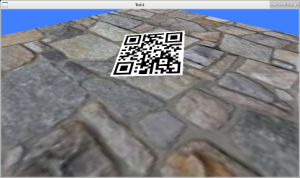 I’ve kept some OpenGL related utility functions out of utils.c so they are all in the main.c source file. Anyway shockingly we’re finally getting to look at some code 😮 ! This is all really boiler plate code, just a few things to note I’ve selected core profile GL 3.3 and set the keyboard into “sticky keys” mode which makes it easier to poll the state of the keyboard. The windows size callback is also worth noting, as it lets us keep a 16:9 aspect ratio with either top or side black borders if needed, I’ll let you figure out how it works, its not complicated but well worth implementing in your own projects. The createShader function is about nothing much more than error reporting than anything else, the shader or more accurately the shader program is made out of a vertex shader and a fragment shader, variables in the shader can be located and accessed but I will talk about this later. There is only one texture unit in use so that uniform is set once and just left as is, just as we only once set the shader unit in use ( glActiveTexture(GL_TEXTURE0) ) . Once we have created the shader program we can delete the constituent shaders. The vertex shader is executed for every vertex of the mesh, i_vert and i_uvCoord are set from the appropriate buffer as we’ll see later v_uvCoord is used to communicate the UV data to the fragment shader. The u_mvp uniform is a four by four matrix which is used to manipulate the position of each vertex, its calculated to give the effect of orientation and perspective on the mesh. 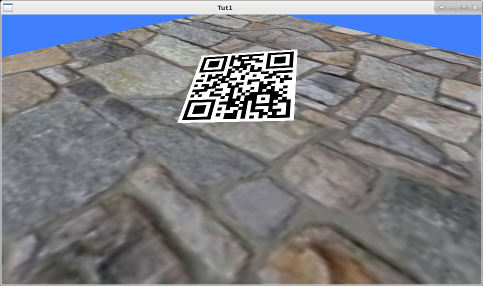 u_tex tells the shader which texture unit to use (here we’re only ever using the same one). The received UV coordinate (v_uvCoord) is used to look up the colour (from the texture) that the fragment needs to be. At first look the VAO (vertex array object) looks a little complicated, but bare with it, its basically just a way to group buffers together. Basically while the VAO is bound any vertex buffer that bound and its current properties are attached to the VAO, for this mesh there is a vertex buffer and a separate UV buffer (texture coordinates). I would strongly recommend you look up each of the GL functions and make sense of how each of the parameters are being used here in particular glBufferData and glVertexAttribPointer I have found docs.gl to be a very useful reference, don’t forget to look at the source code itself not just this fragment so you get plenty of context… (the odd comment in there might just give you the clue you need) From the vertex shader can you see why SQR_INDEX_V and SQR_INDEX_U have the values that they do ? Matrix multiplication is “non commutative” all this means is A*B != B*A so you can’t for example mess up the order when you combine a rotation and translation. You’ll notice from the code that I’m using a “LookAt” function, its worth noting that this is for convenience only and a more usual way, especially in a game might be to just to keep the 3d coordinates and a quaternion for orientation, its fairly easy to create the matrices you need while making it easier to manipulate and keep track of the views orientation and position. You can download the code here, the keys W,A,S,D slide the camera along the world axis while R,F change the height all the while the view is turned to point to 0,0,0. Just as a point of interest how good are QR codes even my elderly phone can scan the rotating QR !